A specialty coffee lager, plus a new IPA from Salt Flats. Believe it or not, good coffee is one of the most requested care packages that servicemen and women request while on deployment; Utah's own Alpha Coffee steps up regularly to disperse their java to those service people who crave a good cup of joe. In an attempt to help Alpha and its mission, Desert Edge has teamed up with the Cottonwood Heights-based coffee-makers to brew a special beer using this wonderful coffee. Desert Edge Alpha Coffee Lager: Head brewer, Chad Krussell used 15 gallons of organic cold brew concentrate from Alpha Coffee in his latest creation. "A portion of the sales from this beer will go toward getting hundreds of pounds of coffee out to our men and women overseas," Krussell explains. I think the beer itself will blow some minds, as it doesn't look like your typical coffee beer. It's a slightly hazy, medium bronzed amber color, with one skinny finger of wispy off-white head. It smells of edgy artisanal coffee, bittersweet cocoa powder, gritty and grainy pale malt and some earthy, leafy and floral green hop bitters. The taste is a bready and doughy pale malt, with a reduced cold coffee acerbic essence and some minor earthy yeastiness. Then, more subtle latte notes appear with a minor leafy, herbal and floral verdant hoppiness. Overall: This is a rather well-made and enjoyable coffee-enhanced lager, representing both sides of the coffee/beer equation. The 4 percent ABV makes it easy to drink, and the sweetness from the malt helps take you into that cappuccino realm. 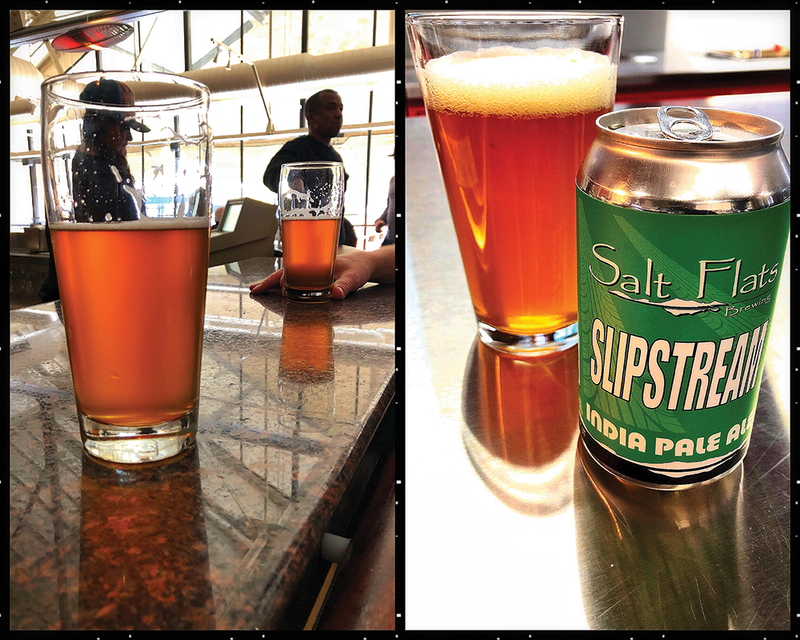 Salt Flats Slip Stream IPA: This India pale ale was one of the first "high point" beers to come out of Salt Lake City's Salt Flats Brewing Co. It pours a deep ruby/orange color with one-to-two fingers of dense, fluffy white foam. The nose is somewhat typical for an IPA—full of grapefruit, lemon zest, orange peel, pine and toasted biscuit. The aroma is pleasant with good balance and complex citrus/earthy hops, along with moderate bready malt notes with solid strength. The taste starts off with grapefruit and orange zest. It builds a sheet of moderate bitterness that will cover the malty bed of honey, light caramel and toasted biscuit that takes over at mid palate. Once your tongue is used to the sweetness, pine and floral/grassy hops assert themselves, keeping the grains from becoming too cloying. From here, it's a tug of war between the bitter and sweet components until the end of the swig. The finish has lingering notes of lemon, pepper and earthy pine. You'll find an impressive complexity and balance of citrus/earthy hops and moderate bready malt flavors, a great bittering balance and zero cloying flavors after the finish. Light dryness from bitterness increases through the glass. The carbonation and body are moderate, with a very smooth, moderately creamy/grainy/sticky and slightly resinous, balanced, satisfying mouthfeel. The 9 percent ABV leaves you with a noticeable warmth. Overall: This is a nice IPA with all-around solid complexity, robustness and a balance of citrus/earthy hops and moderate bready malt flavors. This one is very smooth and refreshing to drink for the style, and would make a good entry-level IPA. While it's not too bitter, it still has decent hop complexity, with a bit more malt presence making for a nicely enjoyable offering. The Alpha Coffee lager will only be available for a limited time at Desert Edge's Trolley Square brewpub; Slip Stream, however, is available at the Garage Grill (1122 E. Draper Parkway), DABC stores and Salt Flat's new brewery pub at 2098 S. Industrial Circle in Salt Lake City. As always, cheers!